Without doubt it is older but no other recordings are located. It is strange that the origins of a song so well-known as "When The Saints Go Marching In" should be shrouded in so much mystery, but very little is known of just that song. It seems to have been published twice in 1896, once with J. M. Black indicated as the composer, and once as having the words written by Katherine Purvis, with music by Black. Some doubt exists, however, as to whether this is, in fact, the same song as the one we know today. Probably, the song is older and might even have originated in the Bahamas. 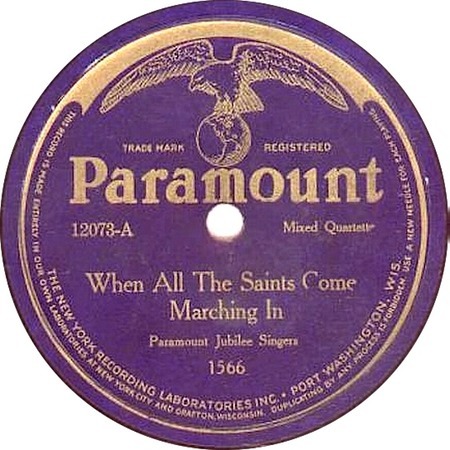 In any case, the first recorded version of a number recognisable to us as "When The Saints" was made in 1923 by the Paramount Jubilee Singers and released on Paramount 12073, with the title, "When All The Saints Come Marching In." Elvis sung along on this "traditional" gospel number with Carl Perkins and Jerry Lee Lewis during the Million Dollar Quartet jam session at the Sun Studios in December 1956. It would be almost 10 years, however, before he recorded a more secular version of the number for the soundtrack of the film "Frankie and Johnny," where it was coupled with "Down By The Riverside."